"... that you can also heat natural swimming pools with a solar-rapid collector?" With a solar-rapid® pool heating system you can of course also warm up the water in your natural swimming pool free of charge. "... which advantages the solar-rapid 25 pipe provides?" The solar-rapid® 25 pipe has a diameter of 25mm. Its special shape means a triple surface area. Like this the heat is absorbed much better. In addition, the special moulding of the ROOS-solar ribbed tube provides more stability. This is why only 1/4 of the thickness of the material is sufficient as compared to other solar tubes with a smooth surface. Advantage: The solar heat is transmitted much faster to the water which flows through the collector. "... how simply the collector is fastened?" On inclined or vertical surfaces, the collector is only fastened at the top. On flat surfaces, the collector just needs to be placed. "... that it is storm-proof?" ROOS-collector on the caribbean island "Guadeloupe". It resisted hurricane "George" (September 1998) without damage.. The collector's special construction ensures that the wind is diverted between the ROOS-solar ribbed tubes and avoids the so-called "sail-effect". "... about its advantages when it rains?" Rain or melted snow and ice can easily pass through the spacings between the ROOS-solar ribbed tubes. On solar panels made of rubber or else , on the contrary, the water stagnates. The roof or any other surface gets dry again very rapidly. 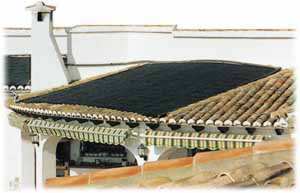 Like this, the roof and the collector are prevented from moss and lichen, as well as from ice in winter. "... why there is no risk of calcareous deposits?" 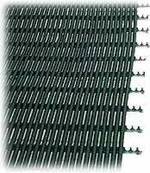 The large diameter of the ROOS-solar ribbed tubes, 25 mm, combined with the material's extension and contraction due to temperature changes, ensures that even small sediments crumble and are flushed away. Advantage: The collector is prevented from calcareous deposits! "... why it is dense under pressure and vacuum-proof?" The parts of which the ROOS-collector consits are tested under a pressure of 3 bar. Pools usually operate with a pressure of max. 1.5 bar. This guarantees a secure reserve and absolute density. The special moulding of the ROOS-solar ribbed tube reinforces the material against pressure from outside and against suction from inside due to the partial vacuum resulting from the water's circulation. Your filter pump is largely relieved from additional pressure that might result from operating the collector. "... why it is not attractive for rodents?" Rodents are very much attracted by collectors made of rubber. The ROOS®-solar collector, on the contrary, is made of special UV-resistant, very solid and rigid plastics. Rodents would come to grief over it and disdain it. "... why you should neither insulate it nor cover it with glass?" To cover the ROOS-solar collector with glass or to insulate it is absolutely superfluous. 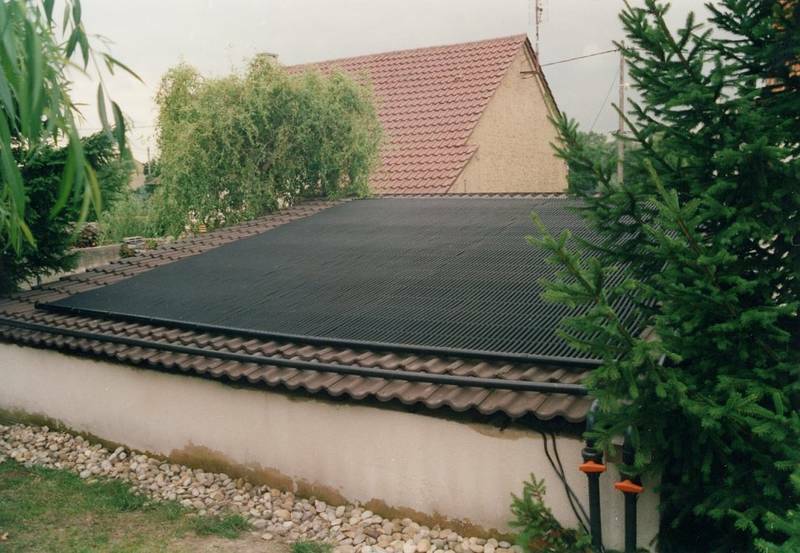 A solar pool heating operates within the low-temperature domain. The difference between the temperature of the circulating water and the surrounding temperature consists of only a few degrees. The loss of heat can be neglected. It is important that the heat absorbed and transmitted to the water flowing through the collector is immediatly transported into the pool. The pool functions as a heat accumulator. "... the weight of the collector?" empty: approx. 3 kg / m2. (= 7 litres) of water. When the ROOS-Solar-SYSTEM starts working, every square meter immediately supplies 7 litres of hot water for your pool. For a collector of approx. 32 sqm this means 224 litres.